I am so please you like them, this also makes me smile. This is lovely! It inspires me to start getting my Christmas decorations out. I love how you did this...great idea for background. That Chris is one tough dude...survived his ice immersion and now doesn't need a coat to be outside! Fun shot. I like it. It is actually a fluffy white table cover. I like the way it looks like snow. @bulldog ah...I thought it was paper towel with a bit of sugar to make snow crystals. So cute!! Reminds me of the thread about using toys in images. Someone was starting this a day or two ago. Great 'street scene'! Wonderful use of your little people! You are so very clever! Nice to see little people having fun in the snow! I think I missed that one, do you know when it was? @bulldog just a few days ago. I'll see if I can find it. 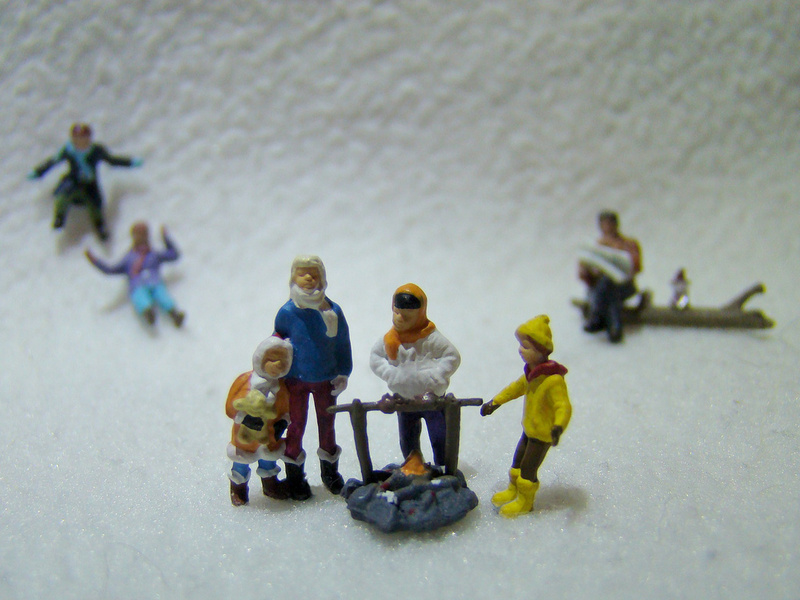 Hooray for the carolling little people, although I see Chris escaped from his ice-block! Now how did that happen Bulldog?